Today’s a big day – huge, even! I’m beyond excited to share something I’ve been working on for a while and can’t wait to start with all of you: Whole Body Whole Mind: Total Wellness Challenge. 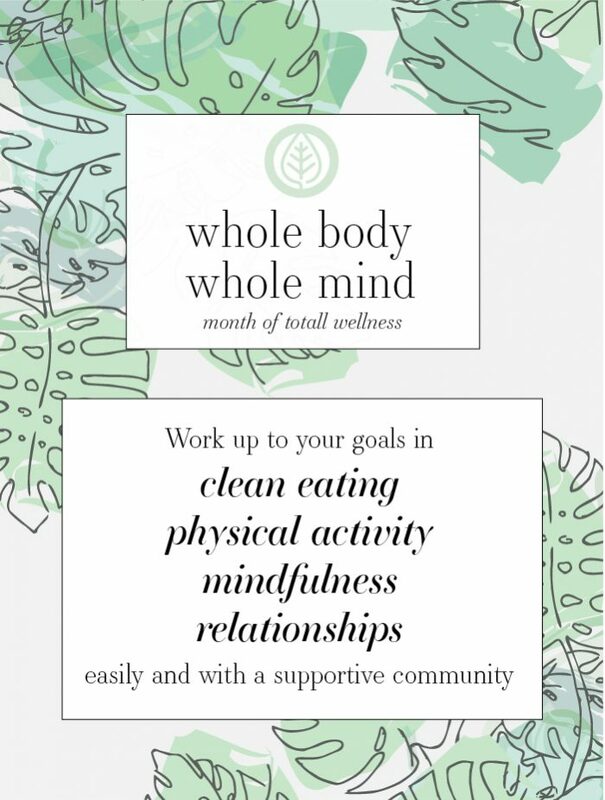 Whole Body Whole Mind is a 30-day program to help you work towards goals that are custom for you, goals that support clean eating, physical activity, mindfulness, and healthy relationships. Will you join me in July for a round of Whole Body Whole Mind? If you’re already a 40 Aprons subscriber, click here to make sure you get the weekly emails offering inspiration and motivation along the way! Whole Body Whole Mind is different from other clean eating or exercise programs in that you set your own goals. I’m not here to tell you that yoga is right for you and you should be doing it 4 times a week or that gratitude journaling is definitely the best way for you to work towards mindfulness or that legumes are jacking up your digestion. Nope, that’s for you to decide! You know your body, or you’ll get to know your body over time. I have recommendations I’m happy to share, for sure, but the specifics? That’s all you, friends. I was inspired to create Whole Body Whole Mind when I realized I’d really let other parts of my wellness go, despite eating squeaky clean. I noted that I could comply 100% with a strict eating program without lifting a finger, and, while eating this way is fantastic for determining what works and doesn’t work for your body, it’s not always the start to a long-term practice. Instead, I wanted to make it easy for other busy people like me to work towards their ultimate food, body, and mind goals without stretching themselves too thin or placing too heavy a burden on their everyday lives. I’m in active mom groups locally, and something I heard over and over was this commitment to individuality, how their family eats and what sort of activity works for them. And another concern I hear all the time when it comes to starting clean eating programs? Overwhelm. They worry that the programs require far too much time, too much money, and are too strict. So I worked on developing Whole Body Whole Mind: Total Wellness Challenge as a way to support modern, busy individuals and families in working towards the specific goals and frequencies that work for them. What does this mean? Well, you set the goals, like… you want to ride your bike and meditate. And then you decide how frequently you’d ultimately like to do this on a regular basis, you know, after the challenge is over. Maybe for you, it’s ideal to avoid dairy and sugar during the workweek, meditate three times a week, and bike four times a week. Or eat “clean” (by your definition, of course) 29 days a month, meditate five times a week and bike twice a week. I don’t care – it’s all you, baby. Whatever it is that makes sense for you, Whole Body Whole Mind will help you get there. Sign up here. You’ll receive a downloadable packet of printable PDFs that guide you in setting goals, setting frequencies, and working up to these goals. Set goals in four categories: Clean Eating, Physical Activity, Mindfulness, Relationships. What do you want your regular life to look like in each of these categories, after the challenge? Maybe you’d like to eat a paleo diet, or maybe a vegan one! Maybe you’d like to give up gluten or sugar or dairy. Think about what “healthy” means to you, and go for that. Whole Body Whole Mind is fantastic for determining long-term goals after doing a Whole30, which I highly recommend. When it comes to Physical Activity, maybe you’d like to start running regularly, or perhaps you prefer yoga. Thinking about Mindfulness, you might like to start a gratitude journal or work up to a meditation practice. Maybe Mindfulness simply means putting your smartphone away after work! And then we think about Relationships: what do you want to do to support healthy relationships in your life? Maybe a regular date night will help you and your hubs reconnect, or taking your mom out to lunch will help show her how appreciative you are that she watches your little one during the week. Relationshipsare a bit more complicated (duh), so you’ll want to determine things you can do to support your real Relationships goals, the ultimate goal being something like a more appreciative relationship between you and your spouse. You might decide that you can support that overall goal by compliment your spouse regularly. Get creative and keep the overall goal in mind here. Once again, it’s you, it’s your body, it’s your mind, it’s your relationships. Write your goals down. Next you’ll plan your ideal frequency. Let’s be honest: eating squeaky clean 7 nights a week and running 5 mornings before work is not right for everyone. But we can all incorporate healthier eating, more physical activity, attention to mental wellness, and tending to relationships into our lives! It’s the frequency that counts. Take that goal to eat a paleo diet: maybe you eat paleo 5 days a week with mindful eating on the other 2 days a week (“cheating” without going overboard – being realistic). Maybe you’d like to eat vegan 4 dinners a week. Or perhaps you’d like to give up gluten and sugar all the time, making room for a few exceptions a month. Consider your Physical Activity goals: maybe you’d like to run three times a week or do yoga four times a week. Maybe riding your bike twice a week works for you. We consider the same with Mindfulness: how often do you want to be meditating, gratitude journaling, putting down the smartphone? And the same with Relationships: how often do you need to be doing those things to reach your Relationships goals? Your goal might be to improve your relationship with your wife, so how can you do that? Maybe you’ll want to give her a compliment every day or plan date night twice a month. Set those frequencies here. Write them down. Let’s say your goal is to practice yoga 4 times a week. 4/4 = 1, so your 1/4fq goal each week is to practice once. The second week, you’ll add a 1/4fq (which is 1, or practicing once), so you’ll practice 2 times. The third week, add another: practice 3 times. Week 4, you’ll practice 4 times. Make sense? You’re breaking down your goals by 4, so you know what to do each week to smoothly ramp up to your goal frequency. If you have a goal frequency that’s greater than 4? You can round down. You can always ramp up one more on week 5 (after the program is technically over) to meet your goal. You can also choose to start Week 1 with multiple practices! It’s your wellness: do what makes sense. You’ll refer to the Frequencies worksheet for a breakdown of these numbers. What if you’re aiming for less than 4 as your goal frequency? Again, do what makes sense for you. Say you want to do yoga three times a week. You might break it down to 1 time per week. You’ll meet your frequency goal early, which is great! You’ll just keep on at your goal frequency once you meet it. Or you could even skip Week 1 and work on the other areas of your total wellness that week, starting with your yoga in week 2. This is YOUR wellness, and YOUR wellness challenge. Do what makes sense. Check out the Frequencies sheet for a breakdown of these numbers. You’ll fill in your Goals Breakdown sheet with your goals, frequencies, and when you’ll be doing what. Fill out your Weekly Calendar. You don’t have to do this way ahead, but it can be helpful to start a week knowing when you’re doing what. If your plan is to eat clean 3 nights the coming week, scheduling the days you’ll be doing so will help you plan, and planning will help you succeed. I highly recommend utilizing the Weekly Calendar sheet with the days you’ll be working towards your Clean Eating, Physical Activity, Mindfulness, and Relationship goals. Print out one each week. Join the Whole Body Whole Mind Facebook group. We’re there to support one another, ask questions, get recommendations, and stay accountable. We’ll share recipes and exercises, meditation apps and gratitude journals, date night ideas and DIY projects. We’ll talk about our struggles and ask for help; we’ll work on our wellness together. Request to join, and you’ll be added shortly! Do it! The next step is to simply do it. Work towards your goals, ramping up each week. Keep adding physical activity and mindfulness. Keep working on your relationships and your clean eating. Ask in the group if you need help with knowing what to eat, what to do, how to get motivated. We’re here for you! Will you join me in July for a round of Whole Body Whole Mind? What are your goals for the challenge? This sounded interesting and I got the pdf but it is blank if I try to open it or print it? Email me here and I’ll send you a fresh copy!